The German book market has been very important for us since the start of the agency. 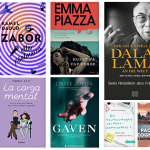 German rights sales have been steady and healthy, and often it’s the first country to offer when we go out with a new submission. But German publishers no longer seem to be as confident in the stability of their market. I hadn’t visited Munich since fall 2015, so it was high time to go back to the Bavarian capital. It’s the first leg of my current Fall 2018 European tour, with meetings in Paris, Amsterdam and the Frankfurt Book Fair to follow. After a rocky start — I forgot my phone at home and only realized this when I arrived at the airport shuttle stop 40 minutes later; fortunately a wonderful friend went to fetch it and brought it to me right before I got on to the shuttle (I will cover any possible speeding tickets of course!) 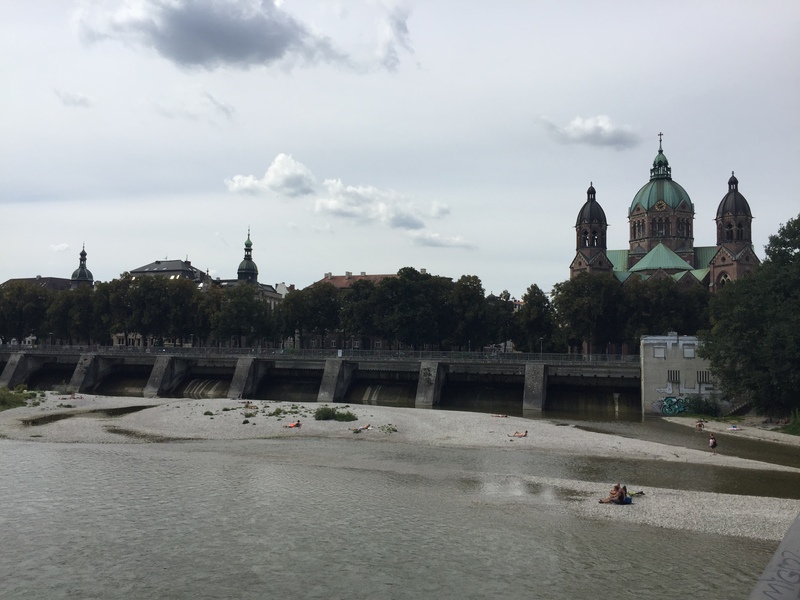 — I arrived in Munich on a warm late summer afternoon. 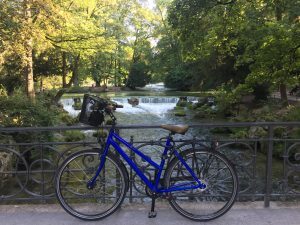 Four days packed with meetings were waiting for me, but first I spent an entire day trying to get rid of my jetlag biking around the Englisher Garten, the city’s impressive central park. Being out in the sun and getting some exercise definitely helped. I felt quite fresh on Monday morning, and ready for my first meeting. 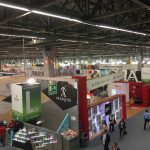 While there was certainly a lot of enthusiasm for the titles I presented during our meetings, publishers clearly showed concern about the state of the German book market. One number kept coming up in our conversations: Sechs Millionen, or six million. 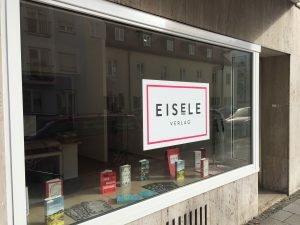 A recent study has concluded that between 2013 and 2017, Germany has ‘lost’ 6.4 million book buyers, or 17.8% (read an English article about this study on Publishing Perspectives). What has happened to many countries including neighboring Holland several years ago, seems to have finally hit the always-so-stable German book market. 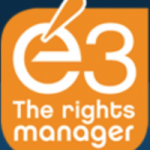 The situation in the Netherlands was particular, since it was hit hard by the 2012 bankruptcy of one of the country’s two distributors, combined with the massive financial problems of one of its major bookstores chains that ended in bankruptcy the following year. Yet other factors are similar, as they are elsewhere, and it’s nothing new: People read less, and revert en masse to other forms of entertainment such as Netflix, Youtube, and other social media channels. As a result, several publishers have reduced the number of titles in their program. As in other book markets, it is especially tough for (literary) fiction. Launching an unknown debut author in hardcover is very challenging, while the bestseller list mainly consists of recurrent, well-known authors. Due to the lower frequency in bookstores, the latter no longer order for the whole season but only for the first 2-4 weeks. In case they don’t sell a lot of copies, they won’t have to return as many since they started out with a lower inventory. In case they need more stock they quickly reorder, making it hard for publishers to anticipate their print runs. Not everything is gloom and doom however, as the publishers I met with showed resilience. Even though it’s uncertain how the German book market will evolve in the next few years, everyone remains passionate about good books. 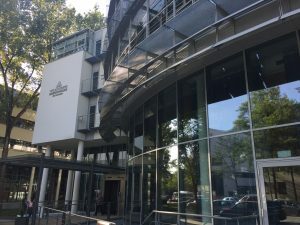 In fact, my week of meetings in Munich week got off to a great start, as we accepted a nice pre-emptive offer from Droemer Knaur for A SHORT PHILOSOPHY OF BIRDS (Petite philosophie des oiseaux, Editions de la Martinière Littérature). They made the offer only a few days after we’d sent out our Fall 2018 Rights Lists. 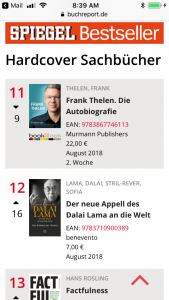 Meanwhile, the German edition of the Dalai Lama & Sofia Stril-Rever’s A CALL FOR REVOLUTION (Appel à la révolution, Editions Massot) published by Benevento entered the Spiegel Bestseller List at number 16, climbing to the 12th spot the following week!